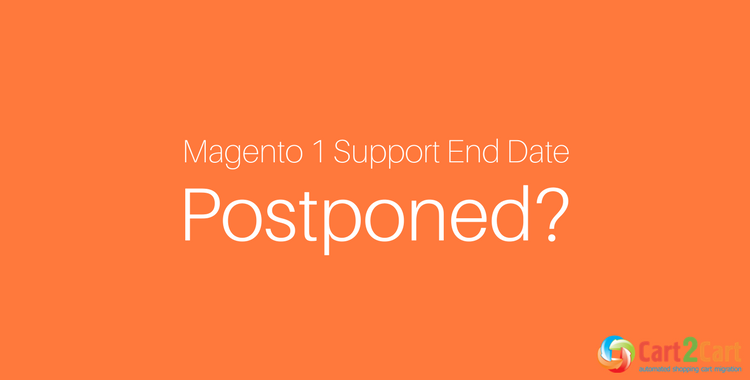 Magento 1 Support End Date Postponed? If there’s anything magentoers would not expect to happen, it did on 30.05.17. Jason Woosley, Vice President of Technology for Magento Commerce, published a post on the Magento blog to “directly address some misconceptions we’re hearing about Magento” and make one major statement: Magento 1 support will be continued for the foreseeable future. Magento 1 support is to continue? This goes contrary to a number of claims made previously that Magento will cease support for eCommerce merchants using its version 1.x platforms by November 2018 - in 3 years after the release of 2.0. It was also announced that they will do a minimum 18-month notice before any changes to support levels. Since 18 months from now is November ‘18 and no corresponding announcement was yet made, it seems Magento 1 support end date was postponed indeed. Though the blog post is intended to “address misconceptions”, the formulations are rather vague. As it was mockingly highlighted by a Twitter user Peter O'Callaghan, the whole announcement sounds like "We'd like to address some non-specific misconceptions with some vague statements". Apparently, as suggested by David Robinson in Twitter discussion, all this means that the previously defined EOL date is being postponed and the official security patches will continue to come out after Nov '18. The suggestion was confirmed by Richard Baik - the Support Manager for Magento Enterprise - which participated in one of Twitter discussions. Correct. Core security patches will continue until further notice. EE license holders can still submit M1 tickets through our portal. It means we'll be announcing extended support program for CE. Considering min 18 mths beyond Nov'18. EE gets as part of license. Stay tuned! The news about Magento 1 support was not met with similar excitement by all the community though. Some of the users expressed their concern that - if the support will be free - many merchants will continue to use Magento 1.x. This might not only cause decline in numbers of Magento 2 upgrade projects, but slow down an already sluggish process of 2.x adoption. What should we expect of such turn of events? Share your thoughts in the comment section below. In love with Marketing. Young eCommerce expert. Strongly convinced that self-development and skills’ augment are equal to success. There is no limit to perfection, or is there? Dream big - Do bigger.